Today is World Lion Day! Celebrate by Taking Action! 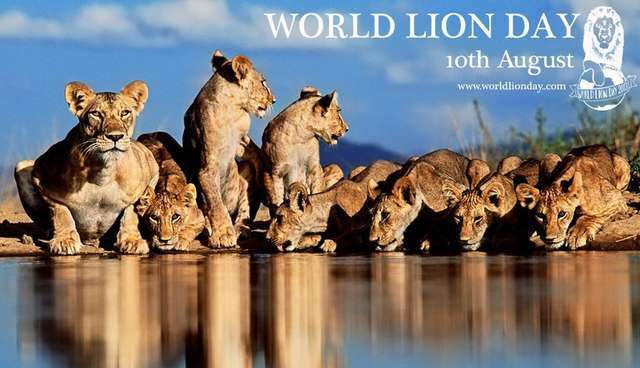 World Lion Day is a celebration held annually on August 10th. The goal of the day is to raise public awareness and support for lion conservation issues. The lion is known as one of Africa's most iconic animals. Few people realize however that illegal killing, relentless habitat loss and over hunting of wild prey by people has left this species teetering precariously on the brink of extinction. In the last 75 years Africa's lion population has declined by 90%. These amazing creatures are victims of habitat loss and degradation as well as human conflict. Today there are more lion statues and images than actual wild lions roaming across Africa. Without immediate action, we may one day live in a world where the only lions we know are statues and mascots. Extinction is forever, so lets not allow it to happen to such an iconic incredible species. Please get involved, only a global effort will save wild Lions! It wouldn't be right to celebrate World Lion Day without remembering Christian the Lion & his incredible story, Elsa the Lioness who changed the world and then of course there is Cecil! Finally, here are a couple of ideas for how you can get involved & roar for lions! Save Africa's wild lions and help prevent the suffering of captive lions in need.